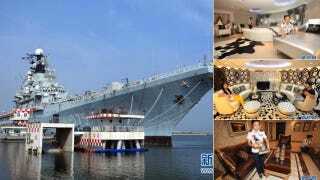 This is not the interior of China's Shi Lang, the recently refurbished Soviet aircraft carrier formerly known as the Varyag. It is another Chinese carrier, also a refurbished Soviet vessel: the Kiev. It's absolutely horrible. Built at the beginning of the 70s, the Kiev served in the Soviet and Russian navies from 1975 to 1993. It was bought by a Chinese company in 1996, which incorporated it into the Binhai military park in Tianjin, in the northern part of the country. Then it was bought by a Chinese company to be turned into a hotel. They spent $16,000,000 in creating this horror, complete with fake naval officers as hotel personell.